I don't know how, but I completely missed the one month countdown of IMCHOO yesterday. Well, I do know how - I had a morning run, I worked all day, then I had an almost two-hour trainer workout. AND my parents came in town. I'm completely running on fumes. No wonder I forgot about the date! But wow - I'm 29 days out from an Ironman. That's CRAZY. Seriously, like any huge challenge, I just can't wrap my head around it. Even with bib numbers and the athlete's guide being released this week - I still can't believe I'm about to attempt a 144.6 mile Ironman. Yes, it'll be 144.6 thanks to the extra bike mileage. I'm hoping, if I finish, to find a custom oval car sticker with 144.6 on it, rather than the standard 140.6. I'll, obviously, be getting more and more nervous as the time grows closer. If you see me out and about over the next 29 days, and I seem a little distracted, please don't take offense. I'm probably just trying to figure out my nutrition plan or how I'm going to survive the Percy Warner-like hills on the IMCHOO run course and make it to the finish before midnight. 29 Days... Sigh. #1229 signing off! IMCHOO - You're Freakin' Killing Me! I'm about a month out of my first Ironman, and while I'm not actually panicking, some nerves have definitely started to set in. Part of this stems from being a first-timer and not knowing what to expect. 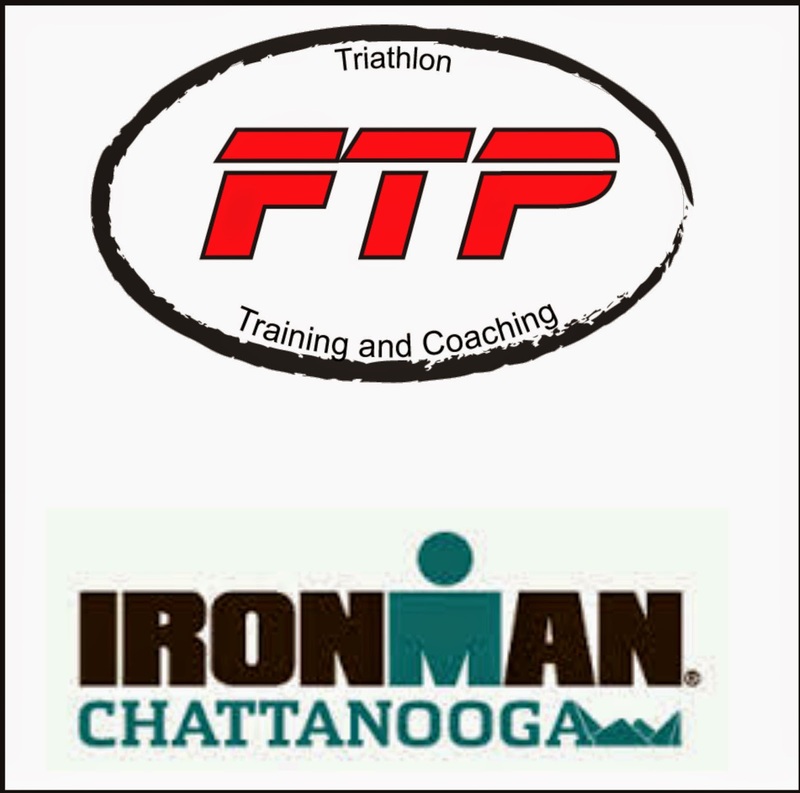 However, my nerves are mainly coming from the people at Ironman Chattanooga, because they keep changing things and it's starting to freak me out. It started a few weeks ago, when IMCHOO released the starting times for the swim. For those who are unfamiliar with Ironman and how they typically work, here's a brief rundown. Traditionally, an Ironman starts at 7 am and finishes at midnight, which gives the participant 17 hours to complete the race. There are also time cutoffs throughout the race for each discipline. Example - you get two hours and twenty minutes to finish the swim. If you take longer then that - you're disqualified. The big issue with IMCHOO is that Chattanooga is in the Eastern Time Zone, and on the far end of it at that. Being that the race is in late September, the sun won't rise until after 7:00 am. You know what people can't do in the dark? Swim. Therefore, the race can't start until after 7:00 am - in fact, it's not officially starting until 7:30. But instead of allowing the athletes to have another half-hour to finish the race (so we would still get the traditional 17 hours), they stuck with the midnight deadline. Meaning, we would only have 16:30 to finish. Now, I actually knew about this when I signed up. There was a little blurb that said something about starting a half-hour late due to the sunrise and that we would only be allowed 16:30 to finish. And, while I wasn't happy about it, I figured it'd be OK. Unless something goes wrong, I (hopefully) won't be finishing in the 16:30-17:00 time frame, so the delay wouldn't really change anything for me. But then IMCHOO released the official starting times.Yes, they are starting the race at 7:30 am...for the professionals. The age-groupers, like me, start at 7:40 am. Again, not a HUGE thing, but now we only have 16:20 to finish. But here's the best of it - originally, the plan (or rumor, I'm not sure, but everyone I've spoken to was under this impression), was that we were going to have a self-seeding, rolling start off of a barge. This means that, rather than having everyone start at the same time, the athletes would be sorted by approximate swim finishing times (that are determined by the athlete). The fastest group would jump in first, and so on. The whole thing should take five to ten minutes to get everyone in the water. At least, that's what we thought. Turns out - we ARE doing a rolling start, but we're getting in one or two at a time. For 2,500 people. The race director stated that he expects the last person in the water at 8:20 am. 8:20!! So, that person will only get 15:40 to finish the race. That's an hour and twenty minute difference from the traditional 17 hours. This situation is going to cause a complete cluster at the swim start, because now everyone is going to be panicking and trying to start first, even though their swim times might not warrant it. One would think that this would be bad enough, but - BUT - the official bike route with aid stations was released yesterday. 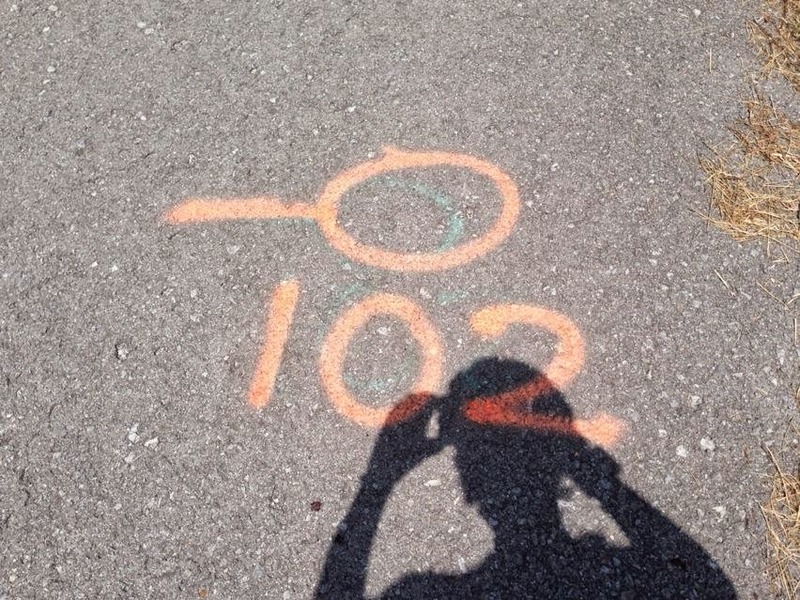 Rather than the standard 112 mile route, the Chattanooga route is now 116. USAT (the governing body of triathlon) rules allow for a 10% deviation from the posted distances in races due to the logistics of each race location, so this additional milage is technically OK. One might think, "what's another four miles when you've already been riding that long?" Well, that's an extra four miles for a tire to flat, or a chain to break, or to (God forbid) get hit by a car. Those extra four miles get exponentially more dangerous if it's raining, especially since there are several sets of railroad tracks we have to cross. Even taking away the risk aspect of the route change, this extra distance is about a 20 minute addition to the average person's bike time. Add that additional time into the already shortened race time, it is possible that a person could have only 15:20 to finish the race rather than the standard 17 hours. And who knows what effect that extra four miles might have on an athlete's run over a VERY hilly 26.2 miles. I'm really doing my best to stay calm, and my coach says that this change shouldn't really effect my race. If I have the race I "should" have, I'll be finished before midnight with some time to spare. However, my time safety cushion is slowly being eroded. Before these changes, I wasn't all THAT worried about flatting or cramping on the run because I knew I had extra time and would be able to recover from any little mishaps. However, I don't really have that anymore. Plus, I've known too many athletes who are in MUCH better shape than I am finish an Ironman past 15:20. Those people might not have made it at IMCHOO. That really freaks me out. I know that this is a first time race, and race logistics will be worked on right up until race day. I know the race director is doing everything he can to make IMCHOO a success for Ironman AND the athletes. However, I do wish I would have known about these changes before I registered. I might have still signed up, but I might not have. I might have found a different, more established race where I knew exactly what to expect. Ironman is hard enough, and throwing last minute (yes, a month out is last minute in Ironman) changes that make the race harder, just doesn't seem right. Especially when Ironman doesn't allow you to get a refund (it was about $650 to register). Of course, there really isn't anything I can do about any of this now. All I can do is to control what I can - my training, my nutrition and my rest. That and just hope for the best on race day. I guess we'll see what happens. 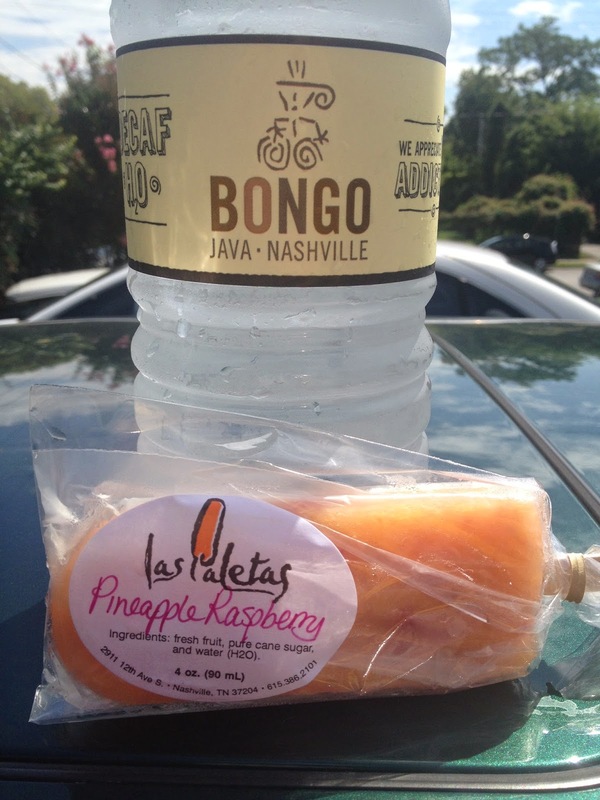 Saturday was the HOT 100 Bike Ride in Murfreesboro. Because I easily succumb to peer pressure, I asked Coach Andrew if I could ride this with some of my FTP buddies, rather than my assigned 4:45 hour ride. Yes, it was going to be a longer ride, but I'm pretty burnt out of running and riding on my own. It was worth the extra hour or so in the saddle to be amongst friends. Of course, I never think of logistics when I'm signing up for things. I just get all excited and wonder what the shirt is going to look like as I'm signing my life away on the Active.com site. I don't think of things like "I wonder what time this ride starts?" and "How far is it from my house?" Nope. I'll deal with those pesky details a little closer to the date. So, it was a JOY to find out that 1) the ride started at 7:00 and 2) it was now a good hour from my house. I've done this ride in the past, but I lived much closer then. A 7:00 am start time now meant getting up at 4:30, leaving my house at 5:30 to get to the ride at 6:30, which would leave me enough time to check-in, get my bike set up, etc. before the start of the ride. This schedule would have been bad enough, but then we realized that the forecast for Saturday was in the upper 90's, so we decided to start at 6:30. That meant I was getting up at FOUR O'CLOCK. Seriously, that's just silly. The drive down to Murfreesboro was awful because I was so tired, but uneventful. The sun was just coming up when I arrived, but the humidity was already thick. Ugh. It was going to be a long day. We took off around 6:40 and made our way into the countryside. I'd done this ride in the past, but all I really remembered was that it was hilly. I was kind of relieved when I realized that we were going on a different route than in past years. Maybe this route wouldn't be that bad? Join us for the 24th Annual HOT 100 RIDE - - - not Race! There are four routes for all levels of cyclists from the 15 mile family ride to the HOT 100 Century with over 6000 ft of elevation gain. I need to pay more attention to information like this. 6,000 feet of elevation gain? That's crazy! And I felt every bit of it - it was terrible. At first, I thought I was just tired because I was really sluggish and weak. I generally warm up after 10-15 miles, but not this time. Every pedal stroke just seemed SO hard. I figured maybe it was "Ironman fatigue" (it's a thing), or maybe I was coming down with a cold. Then, at the 40-mile rest area, I finally had the thought that maybe something was wrong with my bike. Sure enough, I looked down at my back brakes, and they were rubbing the wheel. I basically had been riding 2.5 hours with a parachute on. No wonder I felt so sluggish! Unfortunately, this was something that couldn't be easily adjusted and the repair was going to be a little out of my knowledge-base, since the brake caliper was going to have to be removed. Though there wasn't official bike support at this rest area, there was a volunteer who was bike-savvy and had the tools to fix my brakes. HAZZAH! (A HUGE thanks to him!) Of course, by now, it was around 9:00 and the sun had started to really beat down on us. I texted Coach Andrew while I was getting my bike fixed and told him that it felt like I was riding on the Sun - a very hilly Sun. He texted back that it was character-building, which I took as, "Quit crying and get back on your bike." So I did. The remainder of the ride was pretty much the same as the first 40-miles, though it was MUCH nicer now that my brakes weren't rubbing. It was still stupid hot and crazy hilly, though. I was chased by a few dogs (including one little doxie that I was tempted to take home with me), but I was happy how little car traffic there was on this route. Half the time I felt I was riding on someone's private driveway because that's how rural the roads were. Eventually, we made our way back to civilization and back to Lascasses Elementary, which was the staging area for the ride. 102 hot and hilly miles - DONE. I had a 20 minute run scheduled after the ride. I couldn't believe it, but I actually felt good enough to do it. However, after running for 10 minutes on a highly-trafficed HWY 96, I called it a day. It was a little too dangerous for my comfort-level. Though the ride was hard, and made worse by my brakes, it was a "character-builder" for me. Looking back, that was probably the hardest ride I've EVER done - and it didn't kill me. The IMCHOO route, while still hilly, is easier than the HOT 100. The fact that I got off the bike Saturday and could still run makes me think that I might just be able to do the same on race day. I hope so, anyway. I had a 2-hour run on Sunday - that was OK. My friend Kathy M. ran with me and having her there really helped. Again, it was crazy hot and humid, and I was a little lead-legged from the Saturday's ride (and I cramped a bit), but I survived. It was so hot that I bought a $4 popsicle when I finished. I think it was the best thing I've ever tasted. How hot? $4 popsicle hot. The next big thing I have coming up is the Sunrise Century on Saturday in Clarksville. My parents are coming up and my Dad is going to ride the 33-miler. 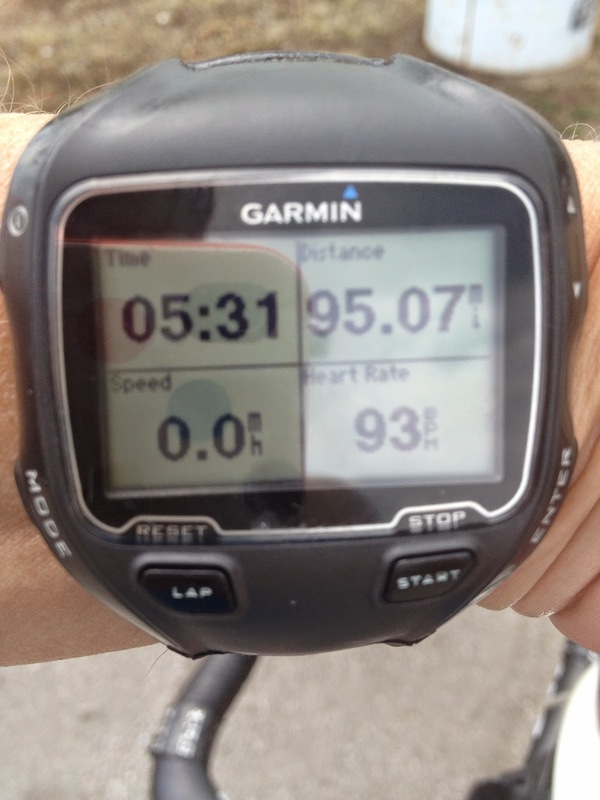 I'm riding the metric, but at a faster pace. How fast? I have no idea. Coach Andrew just told me to "Hang on if I can." We'll see how that goes! So, I'm in the middle of my peak training weeks - the high volume ones that hit right before taper. And, I have to say again - it's not that bad. Yes, I probably made a mistake by moving in the middle of my peak training. As if I wasn't going to be tired enough from working and training, I'm having to unpack at 9:00 PM because that's the only time I'm able to unpack. So, for all of you future Ironmen out there - don't do that. I'm exhausted ALL the time. But if I only had to work and train, I think I'd be OK, as training workload is pretty tolerable. Last weekend, I had a five and a half hour ride on Saturday (Sidebar: I think it's interesting how some coaches assign training by hours, and others by mileage. ), which ended up being 95 miles for me. Yes, I was really tempted to just ride another five miles for an even century, but my assignment was for a 5:30 ride, so I did a 5:30 ride. I'm weird like that. After the ride, I borrowed teammate Paul's Podium Legs, which uses compression for leg recovery. They felt awesome. Who can rock some Podium Legs? 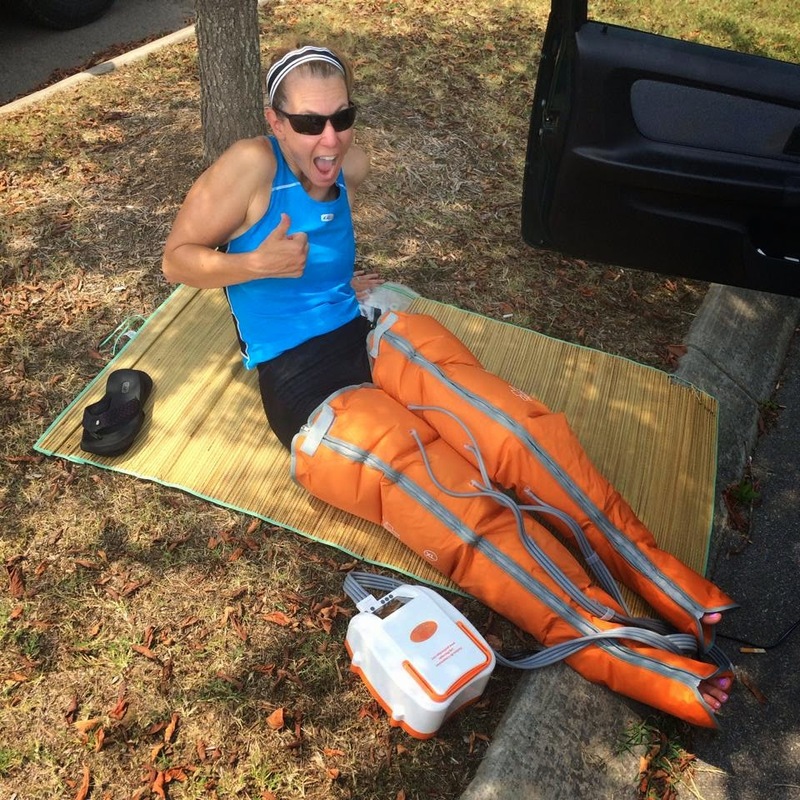 I CAN rock some Podium Legs! On Sunday, I had a 2:30 run. I met up with Melanie, Kim and Jessica in my old running grounds, Concord Park. Unfortunately, they only had seven miles on their schedules, so I only ran with them for part of my run, but it was great to have the company. Unfortunately, a huge storm hit while I was out for my second loop and I got drenched. DRENCHED! I pretty much just ran through the whole storm. I stopped for a while and then figured since I was already wet, I may as well keep going. People huddling under shelters looked at me like I was crazy. My swims have been fine. I'm consistently swimming 3,000 yards / meters (depending on the pool) now. That's a weird thought. The 3,000 distance just seems really far. 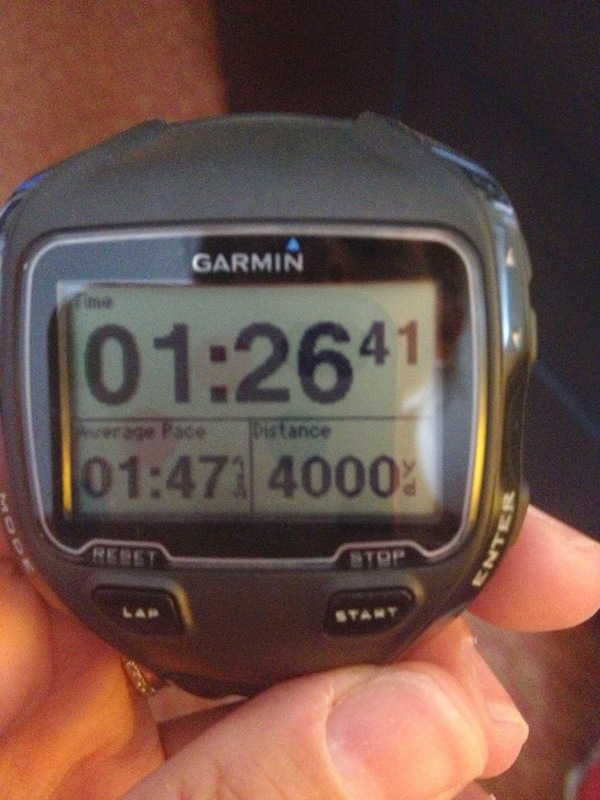 But I'll be swimming 4,224 yards on Ironman day, so I need to get used to it. On a positive note - I know some people who went down and swam the IMCHOO course last Saturday. They all said the swim was fast, which is good. That run is going to be really hard, so it would be nice if there were some current on the swim to help us out. 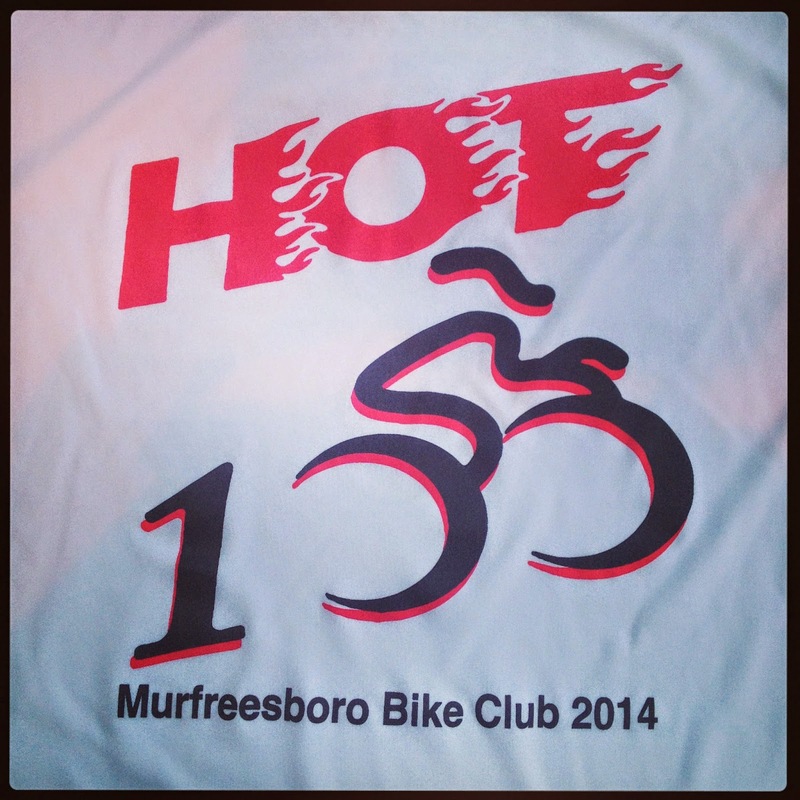 This weekend, I'm doing the HOT100 century, which is a charity ride based in Murfreesboro. Dudley and I have done this ride in the past, though never the full century. It's supposed to be over 100 degrees on Saturday. That should be interesting. I've already started hydrating. This is the third installment of a series. Click here to read the first installment, and here to read the second. Again, the alarm rang at 6:30 am. I barely got any sleep, which is usual for me. I have a hard time sleeping, in general. I just found it surprising that I couldn't sleep after the two days of camp that I experienced. I was kind of dragging, but hoped I still had enough energy to get through the last day. On tap for the day was a 30-mile bike ride, followed by an 8-mile run. That might not seem too bad considering what we'd been through over the weekend, but the ride was up a mountain. Literally - a mountain. They have 'em all over Chattanooga. Coach Andrew had given us two options: we could climb to the top, or turn-around about half-way up before it got "really steep." Though I was temped to go for the whole thing, based on the fact that I'm not the best climber AND I still had an 8-mile run to knock out, I chose to wimp out and only go half-way. Unfortunately, it didn't really matter how long we chose to ride because the weather didn't cooperate with us at all. Not rain this time, but fog. As in CRAZY fog. At first, it wasn't so bad. But as we rode out of the city, visibility got worse and worse. Jessica even had to drive behind us in the FTP Mobile with hazard lights flashing, just so cars would be aware we were there. After about 10 miles, Andrew decided to have us all turn around and head back into town. It was just too dangerous to start climbing in the fog. Now, some of you might be thinking, "oh - so you didn't really get your bike workout in that day then, right?" Wrong. While we did have to cut off 10-miles of our ride, Andrew had us sprint back the majority of the ride. It was our own little time trial for about 7-miles. It hurt and my legs were toast when I was done. 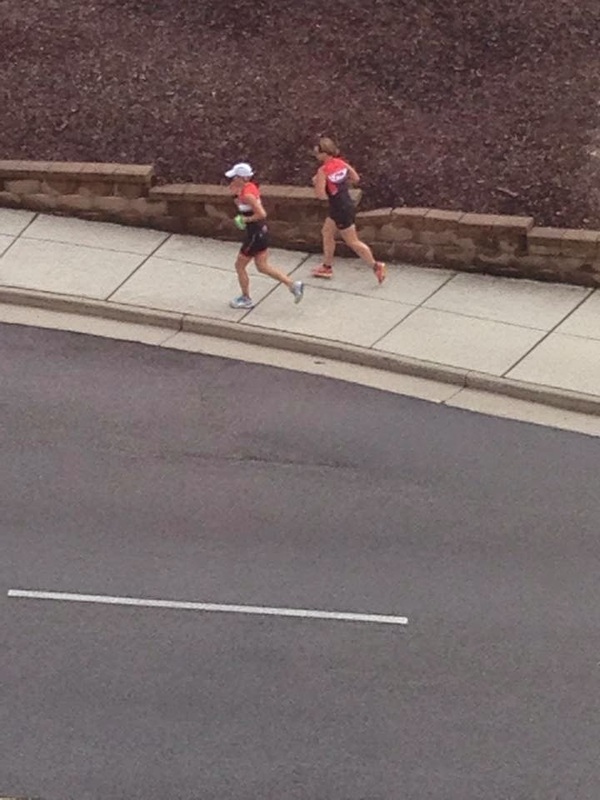 When we got back to the hotel, Nikki and I changed and headed out for the run. This time, we were going to be running the second-half of the IM marathon course. I'd heard a lot of horror stories about this part of the course and how it was just going to kill a lot of people because it was so hilly. I kept thinking that it SURELY couldn't be THAT bad. Surely. Well, let me tell you - it is that bad. While they're not that steep, there are hills on this course that just last FOREVER. There was one hill we were climbing for a few minutes, when we hit a turn on our route. I was so happy to be turning because the road we were on went up for another half-mile or so. Of course, we turned the corner to be faced with a much worse hill. For those who live in Nashville, think of Percy Warner Park as a reference. It's BAD, and yes, it will kill a lot of people, especially on the second loop. I just hope I'm not one of them. After surviving the run, Nikki and I cleaned up, loaded up the car and headed back to Nashville. I was tired, but not completely spent, which I was expecting to be. Again, my training has been gradual and my body has pretty much adapted to anything that I've thrown at it (so far). Overall, camp was a great experience. Yes, we had some issues with weather, but what are you going to do? It was a lot of fun getting to know my FTP teammates better, and I learned a lot about the IMCHOO course and how to race an Ironman. A huge thanks to everyone for making the weekend so enjoyable, even when I was suffering. I also have to thank Nikki for being an awesome roommate and training partner for the weekend. And, of course, a GIANT thank you to Coach Andrew and Coach Jessica of FTP for organizing the entire weekend. As previously mentioned, I had never been to a camp like this before and I had no idea what to expect, but I can't imagine a more organized camp. 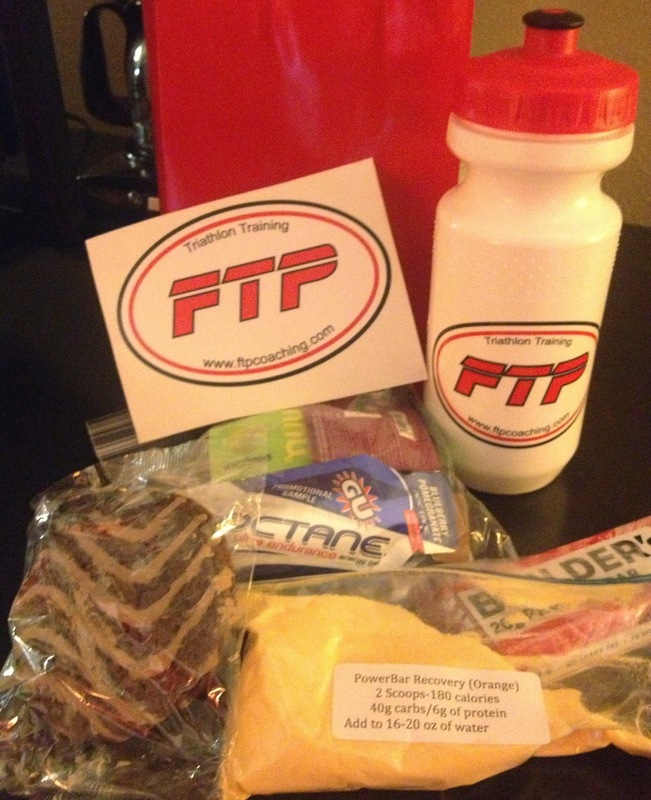 The schedule was clear and followed, the workouts were well-supported and we even got little goody-bags. Who doesn't love a goodie bag? One final note that I hadn't mentioned previously. We actually closed on our house the night before training camp. That's right - Dudley and I bought a house and then I cleared town. He spent the entire weekend painting and moving, while I was out chasing this Ironman thing. So, I would be completely remiss if I didn't say Thank You to Dudley - again - for being an amazing husband and supporter. I wouldn't be able to do this without him. 43 days, y'all! 43 days! This is the second of three installments. For the recap of the first day, click here. Day two of camp started at 6:30 AM. Andrew and Jessica from FTP were smart and made sure our host hotel (Holiday Inn Downtown Chattanooga) served a decent free breakfast, with the key word on FREE. Triathlon isn't a cheap sport - every little bit helps. Around 7:45 AM we all rolled out from the hotel and started our 110 mile ride for the day. The weather was a little iffy. It had rained during the night and the streets were still wet. We also felt some sprinkles at the start, though nothing too bad. The plan was to ride together until we made it onto the more rural roads that make up most of the IMCHOO course. It was going well for the first 10 miles or so...then something happened that has never happened to me before - I fell while riding my bike (Note: I've fallen while racing BMX and I have fallen on purpose to avoid a car, but I've never just been riding along and fallen). The cause of my fall is a common one - railroad tracks. In this case, we were riding along in a group when one of my FTP teammates slid out on the wet tracks and went down pretty hard. I was almost immediately behind him, but fortunately wasn't going that fast, so I was able to get around him. Unfortunately, my tires slid out on the tracks and I went down, too. Good news - other than a bruise to my shin that is still purple over a week and a half later, I'm fine. The bike is fine, too, though a little scratched up. The main thing I was upset about with my fall was that my primary bottle of Infinit nutrition spilt all over the asphalt. Not only would my nutrition plan be messed up for the entire ride, but Infinit is expensive! I hated wasting an entire bottle of it like that. Anyway, we started riding again at a nice, easy pace. Coach Andrew kept stressing to us that we shouldn't kill ourselves on the first lap of the bike, because any hard effort on the first lap would certainly come back to bite us on the second lap. We pretty much cruised and enjoyed the Chattanooga countryside. I held back and didn't take too many pictures, which I'm totally regretting because there was guy on a UNICYCLE out there. Seriously, y'all - a unicycle. Madness. Anyway, I did stop to take a photo of this little guy. Nice to see some support from the locals. Nikki and me with our new friend. I'm not much on writing detailed reports on actual courses, or what my heart rate was and what not. Just know it's a 2-lap course with rolling hills and two significant hills that will really hurt the second time around. Lindsey, Nikki and I stuck together the entire ride and all was going well until we entered Chickamauga the second time. It had gotten progressively colder throughout the day and the wind had REALLY started to pick up. We could see dark (almost black) clouds ahead, as well. Not a good sign, but what are you going to do? We were still 20+ miles from the hotel and we had to get back, so we just kept riding. Of course, the second (and worst) of the previously significant hills is in this stretch. I kept saying a little prayer that the rain would hold off until we got over the hill. I wasn't worried about the climbing - I can handle that (though slowly). No, I was worried about descending down the biggest hill on the IM course in the rain on my race wheels. These wheels are made of carbon fiber which basically don't stop in the rain - the brake pads won't grip. Yes - you read that correctly. Triathletes use gear that is useless in the rain. Smart of us, right? Anything to save a few minutes on race day. Fortunately, the rain held off and we made it safely over the hill. However, the FTP Mobile was there waiting for us at the bottom of the hill. That couldn't be good. Coach Andrew got out of the car and motioned us over. He told us that hell was breaking out weather-wise in Chattanooga, and that he was giving us the option to abandon. At this point, we were at 102 miles, which is the farthest I'd ever ridden (by 2 miles). But we were supposed to ride 110, and anyone who knows me knows I HATE not hitting a training goal. If the schedule says ride 110, then I'm freakin' riding 110!! But then I stopped for a second and thought, "What would Dudley want me to do?" I knew immediately he'd tell me to abandon. I mean, My COACH thought the weather was bad enough to come out and find us. And I had already fallen once on wet railroad tracks - did I really want to face them again? So, we abandoned. We were very fortunate because Jonathan (one of the other "campers" who had already finished his ride) was also worried about us. He was waiting with Andrew and Jessica with his car because not all of our bikes would fit in the FTP Mobile. Sure enough - we had just gotten the bikes loaded up when it started to rain. Hard. I was really glad we chose to abandon because 1) the whole not being able to stop in the rain thing, and 2) the roads back into town have a lot more car traffic. It really would have been dangerous have been riding out in that mess. Of course, as soon we got back to the hotel, the rain stopped. I had flashing idea of getting back on my bike when I remembered that we still had a 3 mile run to knock out before dinner. So, Nikki and I threw our bikes in the room, changed shoes and started running. I was stupid because I forgot to eat something before running, so I got a little lightheaded half-way though, but I made it back OK. I was surprised (and happy) at how good my legs felt considering we had just ridden 102 miles. The last stretch - running back up the hill to the hotel. After a quick shower, we headed down to Urban Stack for the team dinner. It was a lot of fun to relax with everyone after two hard days. Andrew and Jessica also had a Q&A session about all things Ironman. Chattanooga will be the first attempt at an Ironman for most of us at the camp, and the Q&A really helped a lot. It was also cool to think about how much we'd done in the past two days, and that we still had one more day to go! I've gotten behind on my posts this week, but I have a good reason: I moved. Just across town - not to a different city or anything. But it has completely thrown off my routine, training and otherwise. For most of the week, I was OK. I planned ahead and pulled out whatever workout clothing I needed before packing. But later in the week (closer to Friday's moving date) things got a little chaotic. I completely missed my swim on Friday because, let's face it, that just wasn't going to happen with movers and what not going on. I did get my Saturday ride in, though I did have to stop off at a bike shop to air up my tires since I have no idea where my bike pump is. The best was this morning though. I was supposed to run first thing, but I couldn't find my running shorts or shoes. Fortunately, I have an extra pair of running shoes and I finally found one pair of shorts, but by then it was stupidly hot and humid. I "ran" anyway, though it wasn't pretty. All of the stress of moving, and the running back and forth between houses wore me out. I just didn't have anything left in the tank. One thing I realized though - I've possibly moved to the hilliest part of Nashville. I'm not kidding. It's literally called "West Meade Hills." I never need to go anywhere further than my driveway for hill repeats because it's a doozy. The hills are good because IMCHOO is hilly. Really hilly. But hills are also painful. I know they'll make me stronger, but running up that hill back to my house today made me question my sanity. OK, I'll be honest - I walked up the hill back to my house, but I was still questioning my sanity. I'll get back to my FTP Ironman Camp posts later this week, but let me leave you with two sights from my weekend workouts. The first was seen on the Trace yesterday, right outside of the Garrison Creek rest area. 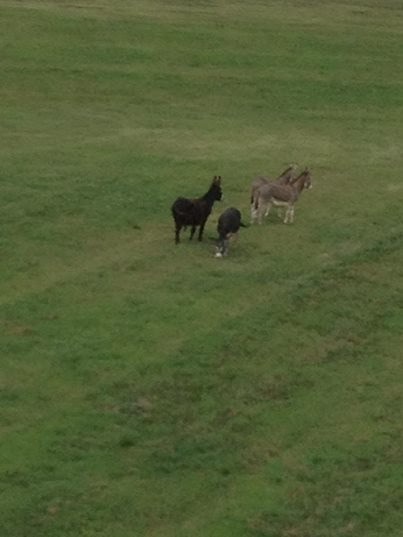 There were four mules (or burros) just hanging out in the field next to the parking lot. This isn't a fenced in area and these guys usually aren't there. Rumor has it they were Naomi Judd's mules, but I can neither confirm nor deny that. She does live very close by though, and they were very well-maintained mules, so I'm going with it. The Park Ranger was there trying to rein them in when I left. I hope they got home OK.
Do YOU see celebrity mules on your ride? No? You must not live in Nashville. My other sighting, and I WISH I had a photo of this because it was CRAZY, happened this morning during my run. I was about a mile or so away from my house when I heard something like metal being scraped. I looked around to see 20+ (yes, I counted), VULTURES perched on one of the neighbor's tin roof. They were everywhere. They were all looking down into the neighbors back yard and they all had their wings fully expanded. I'm assuming they were sunning themselves, but it looked like they were performing a ritualistic celebration of some sort. It was very cool, but VERY creepy. I ran back to the house to get my camera, but by the time I got back, they were gone. If I lived in that house, I would have been freaking out. Only 7 weeks left until IMCHOO, y'all! 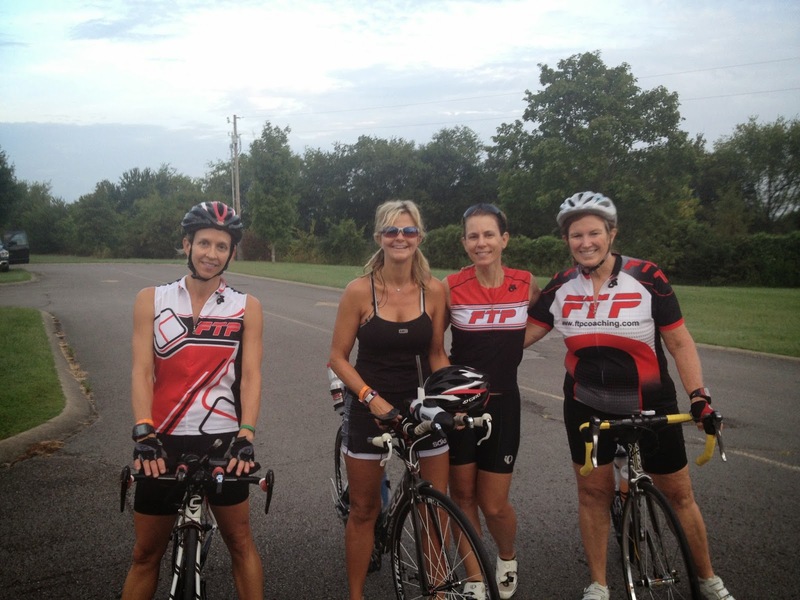 This past weekend was FTP Chattanooga Ironman Training camp. If you're pressed for time and want a quick recap, here you go - It was awesome and I'm still tired three days later. For the longer recap, read on. Camp started Friday afternoon. I've never done any kind of triathlon camp like this previously. Heck - the only time I've ever been to camp in my life was cheerleading camp in high school. FTP did have a mini-camp locally last year, but I couldn't go to every event. Plus, it was local - not quite the same. This was going to be a full weekend of swimming, biking and running on the actual IM course. And while I knew It was going to be hard and hurt, I was really looking forward to it. I had made plans earlier to ride down and room with FTP teammate Nikki. She picked me up at 9:30 for the two-hour trek to Chattanooga.The trip down was uneventful, and we rolled into town with perfect timing - right before the first team meeting. After a round of introductions (most of us knew each other, but there were a few new faces), and a rundown of the weekend schedule, we were off to our first event - a 4,000 yard swim! We headed over to a local pool where Coach Andrew had some lanes reserved for us. I'm so bummed I didn't bring my camera for this because the pool was next door to the Chattanooga Zoo! Prime photo opportunities just wasted because I didn't want to lose my phone. THIS is why I'll never be a photo journalist. Anyway, the swim workout was something like this: Get in the pool. Swim. Now swim faster. And swim faster. Ok, slow it down a bit. Now swim as fast as you can. You get the point. 4,000 yards later (my longest swim EVER), we were done. 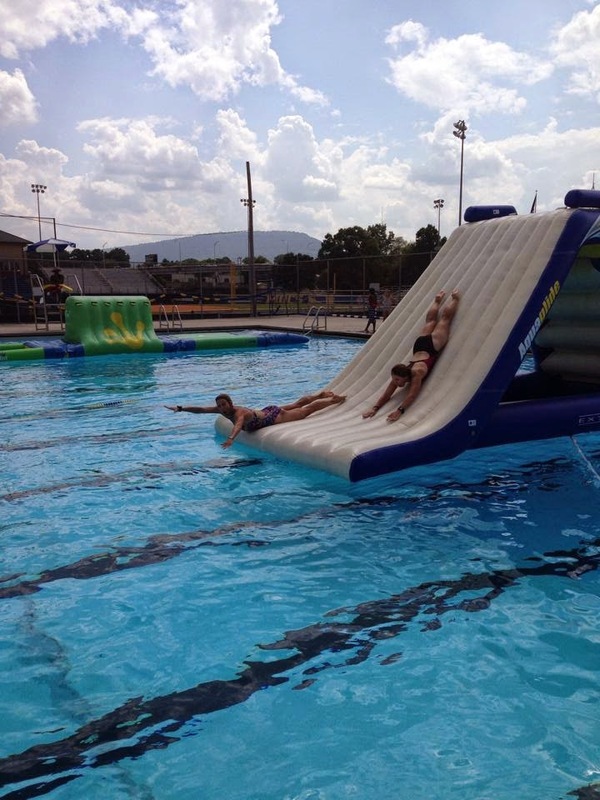 Then we hit the slide on the other side of the pool - because we have to have SOME fun! After the swim, we headed back to the hotel for a quick change. On tap was a 6-8 mile run on the first half of the Ironman course. The first half is the "flat" part of the course, with most of it being on a greenway next to the river. I say it's the "flat" part, because the greenway definitely is flat. However, getting to the greenway is not. It's actually quite cruel because not only are there hills, but you have to climb stairs to get to the greenway. Really looking forward to running up those on race day. The weather Friday afternoon was in the mid-80's with crazy humidity. Add that to the hills/stairs and you have a crazy hard run. My legs felt really heavy. (I actually think it was the humidity rather than the terrain, which gives me hope because it shouldn't be THAT humid on race day.) Fortunately, I had Nikki and a few other teammates to keep me company. 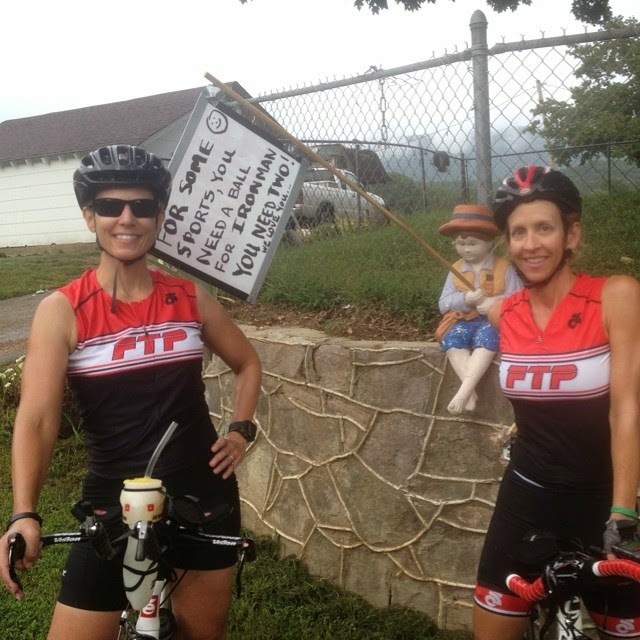 Plus, FTP had a few aid stations along the way. Definitely needed and appreciated! We ended up with 7.5 miles. Not too bad. We were on our own for dinner, so Nikki and I headed over to J. Alexander's to eat. Not exactly close to downtown, but it IS the best restaurant in town. Next up - Day 2 of Training Camp - The Bike Course!